Convert a 10×14 storage building into a livable guest house with solar electric power, passive solar space heating, passive solar domestic hot water, shower and a composing toilet. Keep construction expenses to a minimum and recycle existing resources. Electricity will be available from three sources: commercial grid, a generator, and solar. Eight 6 volt Trojan T-105 deep cycle batteries will power an old 2000 watt Trace 2012 inverter. Batteries canl be charged from three sources: (1) commerical grid when available, (2) generator, and (3) two 50 watt solar modules recycled from a previous project. The higher power inverters usually serve two functions: (1) inverting DC power into AC power, and (2) a high capacity battery charger. Switching between the two modes is automatic. With external power available an internal transfer relay switches cabin power from batteries to the external source. Disruption of the external power source will automatically switch the source of cabin power source to the batteries. When external power becomes available again the batteries start another charge cycle and external power is reconnected the cabin. Multiple sources of heat will be available: (1) a 4000-18000 BTU portable Mister Buddy Indoor Safe Propane Heater ($130), (2) a 5000+ watt portable electric radiator ($39), (3) passive solar heat from two homemade solar hot air collectors. South facing door glass also assists with passive solar heating during clear days. During the summer months awnings will provide shade for all south facing glass. In the summer months a small one room air conditioner will be used when grid power is available. 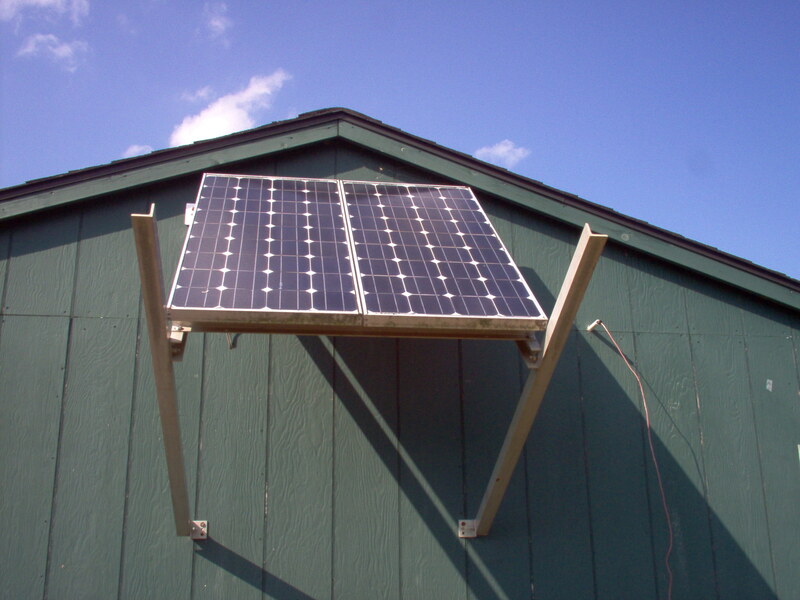 A simple solar batch hot water system created from a recycled hot water heater and recycled patio door glass will provide hot water. A backup system powered by propane or electricity will be available. Another option that I have successfully used was to heat 6 gallons of water (outside) in a propane powered turkey cooker. In about 6 minutes the water was hot enough for a shower. Bringing the warm water inside, the intake from a 12VDC Shurflo pump was dropped into the warm water. The output of the pump was connected to a common kitchen sink sprayer. A plastic stool sitting inside the cattle watering tub provided support while bathing. The process should work just as well in a common stall shower. Two versions of a composting toilet may be used: a Sunmar NE ($1355) left over from a previous project, or a home built sawdust toilet ($35). Water drained from the shower and sink will flow into a mulch filled trench as described by Chapter 9, Branched Drain Design, in the book titled Create an Oasis With Greywater by Art Ludwig.